FILE - An oil technician makes his way to the oil separator facilities in Iran's Azadegan oil field. Falling oil prices are depressing living standards in the Islamic Republic. A big slide in oil prices will hurt Iran's attempts to rescue battered living standards, but economic pain is unlikely to soften the Islamic Republic’s stance in nuclear talks or end aid to allies such as Syria, matters seen by its ruling clerics as strategic priorities. Experts examining Iran’s budget plans for 2015 say economic misery brought by sanctions and mismanagement has been a reality for years, and while social strains are deep among its 76 million residents, the clerics will seek to contain them. The largest drop in oil prices since the 2008 financial crisis means more budget pressure for the OPEC member, already bereft of tens of billions of dollars in oil revenue through Western sanctions and years of economic mismanagement. Tougher economic times may spur Tehran's determination to end a nuclear dispute and lift sanctions that isolate it from the global banking system and deter most foreign investors, the experts say. But don’t expect significant changes in Iran's regional strategy, including its approach to any nuclear deal. That is partly because funds for security affairs come from Supreme Leader Ayatollah Ali Khamenei, not the government. He also decides nuclear policy. "Our support to our brother Assad will never change," said a senior Iranian official, referring to Syrian President Bashar al-Assad. "Because of [declining] oil prices, we face economic hardship ... but we will manage to continue our support to Syria, militarily and financially." Ali Vaez, a senior analyst with the Brussels-based think tank International Crisis Group, said the falling oil price would hurt but probably wouldn’t make Iran accept a nuclear deal "that it views as lopsided." "Iran's support for its allies in Iraq and Syria is not a question of means, it's a strategic necessity," Vaez said. "This is why neither the fall of the rial in 2012 or economic malaise in 2013 affected Iran's support for its Syrian and Iraqi allies." Iran and world powers are negotiating to end a standoff over Tehran's nuclear goals. Tehran denies Western charges that it’s seeking nuclear weapons. 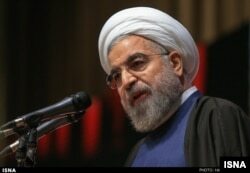 Iranian President Hassan Rouhani presented a 'tight' budget based on falling oil prices. President Hassan Rouhani presented a "cautious, tight" budget December 7 in response to oil prices that had fallen to $70 a barrel. Now, the rate is almost $10 lower. Spending was 6 percent above this year, but with inflation of 20 percent, it represents a cut in real terms. But with revenues pressured, plans to hike defense spending 33 percent prompted speculation that Rouhani wants to placate security hardliners, hoping they will indulge his bid to win a nuclear deal and end sanctions. Powerful anti-Western hawks in the Islamic Revolutionary Guards Corps (IRGC), who report to Khamenei, have been wary of the negotiations. They have tolerated the talks, diplomats speculate, largely because Rouhani’s big 2013 election win revealed the depth of anger over economic mismanagement and support for his aim of ending Iran's international isolation. Iranian-born economist Mehrdad Emadi of Betamatrix International Consultancy suggested Rouhani had to consider the IRGC in setting economic policy because it could spoil any nuclear deal. Greater defense spending was aimed at "giving them a big piece of the public pie so they can stop kicking up a fuss when it comes to negotiations, especially those with the Americans," Emadi said. "The IRGC are extremely sensitive to any reduction of 'military aid' to what they see as strategic allies." The IRGC could ruin any rapprochement with the West it felt might hurt its interests. Last year, Iran granted Syria a $3.6 billion credit facility to buy oil products, with another $1 billion for non-oil products. Domestically, the government has ways of mitigating the pain. One is gradually depreciating the official exchange rate at which it converts oil revenues from dollars into rials. This allows a progressively smaller amount of dollars to supply the same rial revenues. The central bank's official exchange had dropped to 27,043 from 25,651 at the end of June and 24,774 at the end of last year. Next year's budget is based on a rate of 28,500, showing the government plans to continue this strategy. Meanwhile, the rial’s free-market price has stabilized at about 35,000, far from lows near 40,000 two years ago. That suggests most Iranians think that while cheaper oil will pressure the rial, they do not yet expect an economic collapse or a run on the currency. Emadi said Rouhani would try to shield the poorest from spending cuts to avoid any repeat of the unrest that followed 2009's disputed presidential election. A 30 percent rise in bread prices December 1 rattled Iranians, but there was no major unrest. Emadi said the government later took steps to compensate poorer households. There could be further subsidy cuts. But open protest was unlikely because "the regime's machinery of repression still makes this very risky," said Scott Lucas of EA WorldView, a specialist website on Iran and Syria. Saudi Oil Minister: Why Cut Production?